…to do things a little differently today! I have in the past blogged about the benefits of saving your baby’s cord blood. 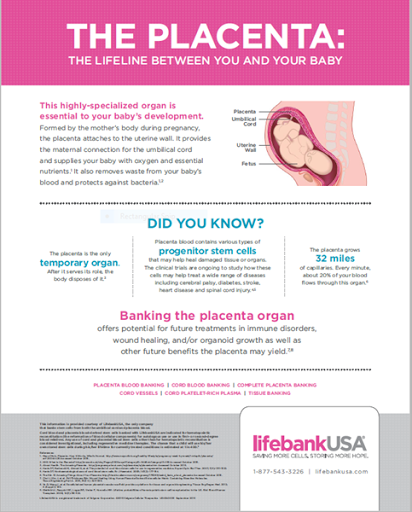 Now, LifebankUSA has asked me to share this information about placenta banking as well. By banking placenta blood, you can preserve even more potentially life-saving stem cells when your baby is born. I am sure you know about the power of the placenta, but here is a reminder. The placenta is a highly-specialized organ that provides your baby with oxygen and nutrients. It also regulates the temperature of the fetus, removes waste from the baby’s blood, and fights against internal infection. As well, it produces hormones to support pregnancy. It is the body’s only temporary organ, and after the baby is born, the placenta comes out as well. After a baby is born, there is blood left in the placenta, which is a rich source of stem cells that can be collected and stored in case the baby or a close family member needs them in the future. Placenta banking is an easy and painless procedure for the mother and baby. The stem cells found in the placenta can be used for transplants to treat diseases such as leukemia, metabolic abnormalities, and inherited diseases of the immune system or red blood cells. Stem cell transplants replace other cells in the body that are either destroyed or not working. Collecting placenta blood in addition to cord blood banking makes your collection even more powerful by doubling the number of stem cells collected. More stem cells can improve transplant success and can allow you to treat more than one health condition. LifebankUSA is a private cord blood bank that offers patients the option of placenta blood banking as well as cord blood banking. They are the first and only private cord blood bank to provide stem cells from placenta blood for a successful transplant. The placenta plays an important role in many cultures and many societies conduct rituals regarding its disposal. For example, the Maori of New Zealand bury the placenta to emphasize the relationship between humans and the earth. The Navajo, the Kwakiutl of British Columbia, and other cultures also bury the placenta. The Nepalese think of the placenta as a friend of the baby, while the Orang Asli from Malaysia see it as the baby’s older sibling and the Igbo of Nigeria see it as the deceased twin of the baby and provide it with a funeral. Native Hawaiians believe the placenta is a part of the baby and plant it with a tree that grows along side the child. In some cultures, the placenta is eaten or dried and used in medicines. [source] Like these cultures, LifebankUSA sees the placenta as a powerful tool that can be used to save lives. What do you think about placenta blood banking? And what’s okay with you this week?